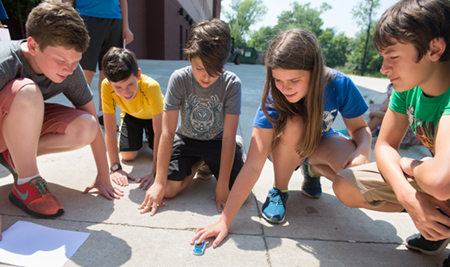 Explorers, expert observers and super sleuths are energizing Southern Illinois University Edwardsville’s campus during Odyssey Science Camp being held July 17-28. Organized by the SIUE Center for STEM Research, Education and Outreach, more than 110 students, grades 2-9, are engaging in a variety of interactive activities aimed at fostering an appreciation for science, technology, engineering and mathematics (STEM). Camp activities range from introducing scientific principles, building math skills, conducting simple “crime science” investigations and constructing a Lego® robot. New this year, campers are exploring renewable energy sources. 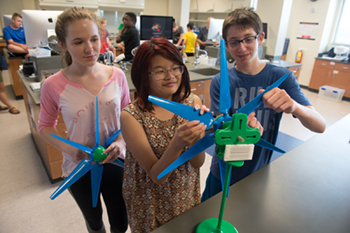 “Renewable energy is an important topic, so we thought it would be valuable for students to learn more about wind turbines, solar cells, hydroelectric turbines and hydrogen-powered vehicles through hands-on activities,” said instructor Ron Mayhew. Students, grades 7-8, analyzed the angle of wind turbines’ blades and learned how that affects revolutions per minute (RPM). They also experimented with solar cars by testing the distance the cars traveled in relation to the amount of time they charged and weather conditions, such as cloud cover. Not only is Odyssey Science Camp comprised of experienced area teachers, it is also supported by SIUE students who are participating in the Robert J. Noyce Scholarship Science and Math Grants, funded by the National Science Foundation, which provide summer scholarships for qualified STEM students interested in teaching. The SIUE summer scholars find it exciting to inspire younger STEM-motivated learners. For more information on the SIUE STEM Center’s Odyssey Science Camp, visit siue.edu/summer/camps/odyssey-science-camp. Photo: (L-R) Allyson Lunsford, Qiong Domingue and Montgomery Hubler adjust the blade angles on a wind turbine during their renewable energy course. (L-R) Adam Johnson, Trevor McGeehan, Lucas Schardt, Maddie Burkart and Drew Klingsick get ready to test a solar car during an experiment.